Tasmania Fire Service crews have made good progress suppressing fires across the state today, taking advantage of favourable weather in anticipation of a return to challenging conditions over the next few days. The TFS has 46 fires listed and 27 of those are considered "going" fires. All resources are being used to build control lines and most of the alert levels on the Central Plateau fire have been downgraded. One property was destroyed by fire overnight by the bushfire (Great Pine Tier Fire) burning near Miena, despite the best efforts of the landowner and the TFS. A total of 55,000 hectares has burnt since the end of December when the Gell River fire in the south-west started from lightning. Crews have been battling a combined 720km of fireline. While today has provided some respite, Deputy Chief Officer Bruce Byatt warned that Friday was forecast to bring the worst fire weather for this bushfire season so far. "While a lot of work has been done to date, it's not over yet," Mr Byatt said. "We are preparing our crews for these conditions, including prioritising where fire trucks and aircraft will be working with our priorities being to protect life, communities and infrastructure. We're urging all Tasmanians to think about their bushfire survival plan and suggest to people to avoid bushland areas on Friday. "Conditions predicted for Friday will see fast moving and uncontrollable fires. 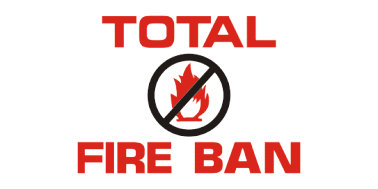 With multiple bushfires currently burning across our state it is critical that the community abide by the Total Fire Ban that will be in place from 2am tomorrow (Thursday, January 24, until 2am Monday, January 28). "That Total Fire Ban applies to the entire state. This means all outdoor fires, barbecues and portable stoves using wood, charcoal or other solid or liquid fuel are banned. If you are planning a barbecue, electric and gas stoves and barbecues can be used provided they are at least one metre clear of flammable material. "We make this decision to protect all Tasmanians from the threat of bushfire. New fires in the landscape on top of what we are dealing with now will push us to the limit. Any new fires that do start will put communities at great risk. We must not be complacent ahead of the severe conditions we are expecting. "We expect that many fires we have successfully contained will break their containment lines on Friday if the predicted weather conditions eventuate. While we want everyone to enjoy their weekend, we would ask people to reconsider holidaying in bush or remote locations. It is your responsibility to keep you and your family safe, so make good decisions now and don't put yourself in harm's way. "The day of particular concern to us is Friday because of high winds, high temperatures and low humidity. We urge you to be prepared for this," Mr Byatt said.